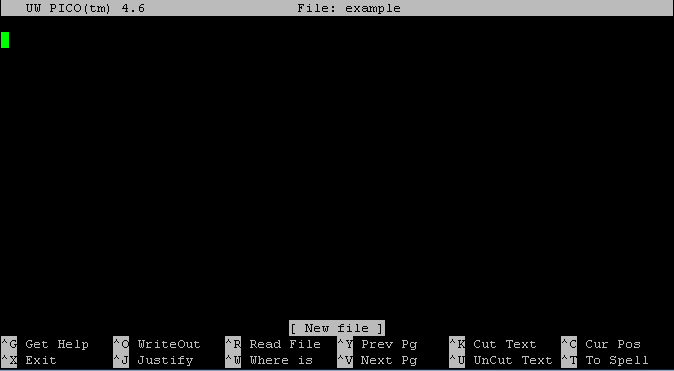 When editing files in a GNU/Linux system, beginning users will want to utilize the program Pico as their text editor. For the most part, Pico (short for Pine composer), is a simple and straightforward program. 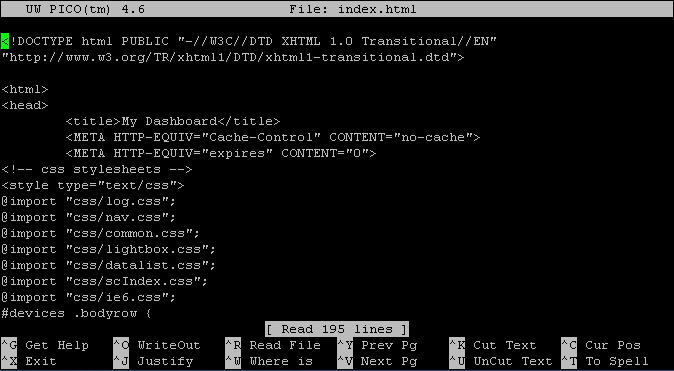 This document will guide you through creating, editing, and saving a text file using Pico. For more advanced users, Vim and Emacs are also available on our systems. * Note: Nano is another editing program very similar to Pico and you will often see the names used interchangeably. After you press enter, Pico will launch a document called “important_information.” If this file already exists, you should see the current contents of the file. If it doesn’t already exist, you are now editing a blank file called “important_information.” Once you save the file, it will be created. That’s it! Your file is saved. You can now press ctrl+x to exit pico. Built in help: Pico features a built-in help system. By pressing ctrl+g, you will see a listing of commands. Searching for text: You can use ctrl+w to search for text in a document. Using Page Up/Page Down: Your Page Up and Page Down keys will scroll through a page of text. You can also use ctrl+y and ctrl+v to scroll up and down. If you run the command pico without any file name, it will load a blank document that will look much like the screenshot below as well. If you spend a lot of time using Pico and would like to use a more powerful editor, consider learning about Vim and/or Emacs. These editors are much more powerful than Pico and while they have a larger learning curve than Pico, are much more efficient once you get used to them. Both are installed on the UW’s clusters.